thank you very much for all the feedback I received on the File Upload/Download how-to over the past years. I have great news: Basically every development request has been implemented! Yes, this means that there is a big load of new features available with version 3. Upload and download of CSV files and a new user interface that allows the preview of the file and plan data before you save it are just two of the highlights. The new version is also compatible with SAP BW 7.4. Minimum release to use the new version is SAP BW 7.30. You can download the complete how-to guide as well as the solution from SAP Note 2053696. Here are a few screen shots of the version 3 user interface (Note: The old UI is still available in the version 3 transport). For more details, please refer to the how-to guide (see “Download” section above). As always, I appreciate your feedback. It’s as simple as adding a comment to this blog. Enjoy the new File Upload and Download for BW-Integrated Planning! 1. Can we perform load with multiple Amount/Volume column, each representing a time period? 2. Can we use the characteristic relationship that we have maintained for infocube to derive the fields while performing the writeback of data to database? Your inputs will help us big way. Thanks Again for your valuable blog. yes, you can load files like you describe. However, you will have to use the BADI to transform your file structure to the structure of the aggregation level. There’s an example provided in the appendix. The upload automatically uses all characteristic relationships – just like any other planning function. thanks again for your very useful solution. I integrated the file upload web dynpro into my web planning application. Now i have probles with the different prefixes of the webdynpro path when transporting from dev to test and prod. I implement a custom web item and compute the prefix as described by you. Can you provide a small example webtemplate code for showin how to use the result of the custom web item to generate the URL to the planning sequence. I think this would be very helpful to all. I’m sorry, but I’m too busy with SAP BW/4HANA and won’t have time to develop this. I’m sure that others have coded it already. Please search in the community or ask for help there. expecting that with the upload we would not encounter locking errors and the user can edit the uploaded data right after upload in the planning mask. What would be the best way to integrate the functionality into a web template? Is it as Timo write to create a custom web item that call the web dynpro? Would it also work, if we just integrate the planing sequence (that includes the file upload function) into a button in WAD? Unfortunaly, Hierarchy node variables are not supported yet in the how to solution but have you planned to develop it? PS. We are in BW 7.5 SP6, but we still use your solution because new standard file upload solution does not work properly yet. Nice to hear that you are still using it (well, I know many customers are 😉 ). I’m sorry, but I’m too busy with SAP BW/4HANA and won’t have time to develop the enhancement for hierarchy node variables. If you come across a working WebDynpro for these variables, I’m happy to take a look and try to integrate it (if allowed to reuse the code). I have issue with FF upload using hierarchy-variables. Confguration i use is AFO 2.6 sp01 x86 32 bit with workbook/excel 32bit. Webdynpro exits with 500 server error. But ST22 mention ASSERTION FAILED. When debugging webdynpro ZRSPLF_FILE_UPLOAD it exits at component Views, method ONACTIONON_UPLOAD. READ TABLE lt_fields INTO ls_fields WITH TABLE KEY m_id = l_id. But it starts in method WDDOMODIFYVIEW where variables are handled. When i use hierarchy node in planningfilter, it works but not desired as user needs auth on all nodes. If we use hier variable then it stops. In debugging we see that variable is a type 2 variable and that values are not saved by the program. As we also use in same test type 1 variable we see it comes through. Is there a version where type 2 variables work properly? There is no support for hierarchy node input variables (see the HTG, 3. Prerequisites, Limitations). Sorry, I don’t have any solution. 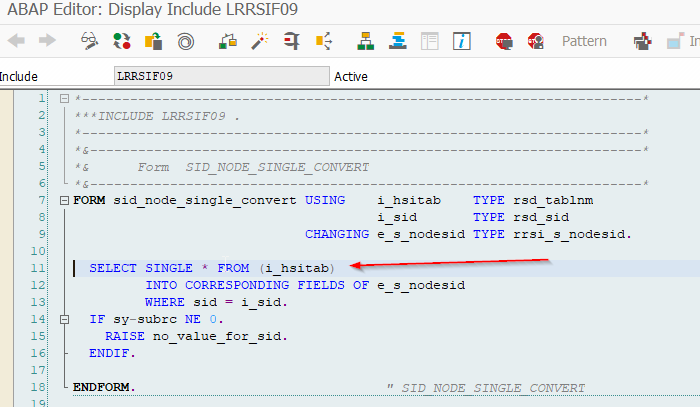 You might be able to use an exit variable (select-options) and derive the single values from the hierarchy node (which you somehow have to pass to the ABAP backend first). Standard function 0RSPL_FILE_UPLOAD_AO (file upload for analysis for office) doesn’t work and looks like it will not work for along time. See note 2461345 for more details. we encountered the same problem as Aleksandrs that planning function type 0RSPL_FILE_UPLOAD_AO is currently not supported within Analysis for Office. The note 2471638 suggests to wait. Do you have an idea in which version of Analysis it may be expected? It’s not included in the latest roadmap of Analysis for Office. I don’t know any details about the AO roadmap or when the upload function is planned for. Either continue to use the File Upload I provide or contact the AO team for more information. with AO 2.7 those planning function are now working. I’ve been using your utility for good few years now with good results. However we have recently upgraded to 7.5 and consequently imported new version of the tool. As a result it stopped working. It seems that new version performs file format checks in a different way. In version we used previously, one of the KF to upload was with currency but there was no currency in the file. Instead, variable exit of the very first variable in the filter was reading first record of the file and determined currency based on its content. This doesn’t work anymore, apparently new function is checking file consistency (here-missing currency) before variable exit. When I set currency as fixed in planning filter, upload works, even though I stil don’t see exit variables setting locks in rsplse. I was wondering where is a proper place to apply code to continue using application as we did before i.e. 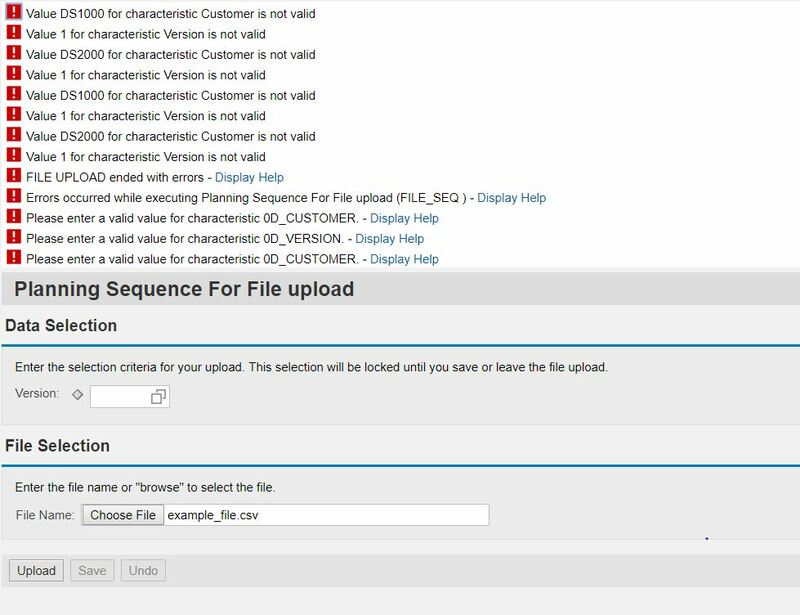 being able to set variables based on the first record of uploaded file, instead of setting them upfront. 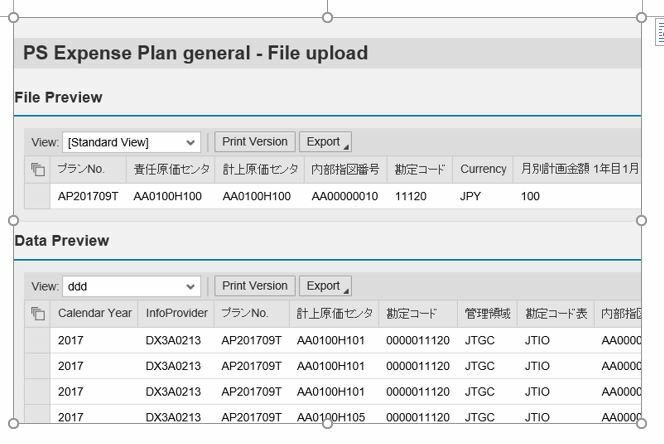 In general, the filter is set before the file is processed by the planning function (upload). This means defining variables has to happen before the actual upload function. Something like this is not foreseen. The file content is stored as an attribute in the assistant class (by the WebDynpro). You can use this in your exit. However, it’s in raw format and you will need a bit of ABAP to get to the actual key figure or currency key value. We have tested and retested behaviour in BW 7.3 SP8 and BW 7.5 SP5 (with only change being new version of upload function applied from the note). I am 100% certain that variables in 7.3 are called again after data is imported in its raw format (i.e. 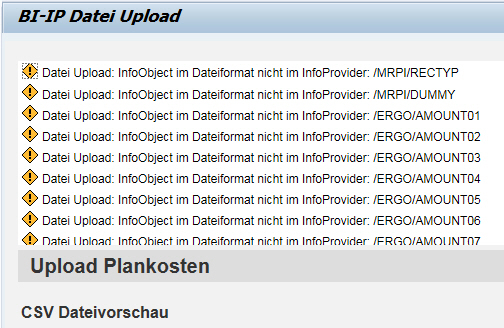 after click on upload button) to BW and we did all the ABAP to read it and use for exit variables. First variable has also logic to validate file / data format, then other are used for derivation of values (e.g. is sales org in first record is S001 then Company Code determined by variable is DE01). In 7.5 exit variables run only once, even before user click on browse. this means we cannot set variables depending on loaded data. I wonder if there is any way to restore behavior from 7.3? chapter 5.13 lists a few SAP Notes related to this issue. Please make sure you have SAP Note 2200044 implemented with the proper RSADMIN switch. I am uploading a csv file downloaded from system, picked one line a changed a key figure to test the upload. Regarding the error I tried to enter in excel 10,010 change it to textto number, but there is no way forward. you have to be careful which program you use to edit a file. Excel probably saved it with a different character encoding (for example “Western European Windows” format). You can change the format under File > Save As > More options > Tools > Web options. Either use a Text Editor that keeps the character encoding of the original file or change the character format in the upload function. You are absolutely right, thanks for your remark. what is the character encoding that works? In the web options, I saw that my xls is set on “western european windows”. I changed to unicode, utf8, us-ascii, no luck. Found it: there was a “scandinavian” character in my data set. ø is not accepted in the upload… Changed it to o and it worked. System transposes the the values of the two fields to each other. e.g before the download lets say field A- 1.000 and field B- 2.000, After the upload and refresh the Data the value Transposes to A- 2.000 while B- 1.000. please what might cause the problem and possible way to fix this. I am just wondering if the upload would work also for new master data together with values? Thanks a lot for a short information. no. Master data must exist before plan data can be loaded (unless of course an InfoObject does not have a master data table). It’s the same with any planning function. the transport is compatible with 7.3 and higher. Please import with “ignore component versions” turned on. We are migrating BW to v7.4 so upgrading from v2.4 to the v3 version of this file upload. v3 works on new system for uploading actuals, target etc. but I have a commentary upload (ie no key figures in upload file) which doesn’t work. Running the planning sequence and selecting te file through gui or web just says ‘0 records read’. I’m not aware of this issue. Could you please send me an email? Thanks for great updates for the solution! I have a question about authorizations concept. using authorizations, provided in appendix, leads to errors while save process. web dynpro is getting started, but it’s unable to save data, system generates error message “you have no authorization for info-cube Z* with 02 ACTVT”. yes, the user needs change authorization. Please adjust the role accordingly. I have configured the file upload functionality and it works fine. The user is presented with a web layout where they enter varialbles, browse and upload their files. However now the users want to to upload large files (around 2 million records). The Web layout takes about 25 mins for the upload. However the ask is if this can be pushed to a “background” job. Which means the user uploads a file to a shared folder and the Planning Sequence is called through a process chain passing the File Name as a Variant. Will this work? the upload was never intended for mass data. That’s also documented in the how-to guide (PDF). It’s much better to use the standard file upload feature for BW. 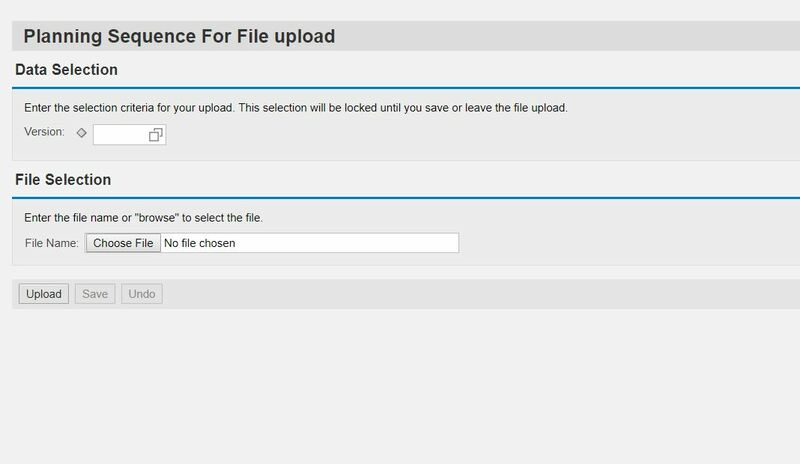 There is an option to run the file upload planning function in batch but it’s not integrated with the web UI. 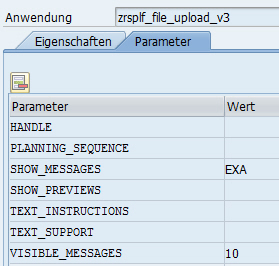 You would specify the file name on the application server (has to be accessible from AS ABAP) in the planning function parameters. Then schedule the corresponding planning sequence as a process chain. Two challenges: Setting the right variable values and concurrent planning sessions/locking. For a single user case, these are easy (hard code the variables in the process chain, tell the user not to change data at the same time) but for multiple concurrent planning users this won’t be easy especially if they need to plan on the data at the same time. I’ve seen that not only me has the issue with characteristic as key figure. I tried a simple scenario. A direct update DSO with planning mode – ON is included into aggregation level. In DSO I have an object for comments which is set to characteristic as key figure. And I can plan it for example in RSRT. I checked this. But when I use File upload tool I have no errors, but any text placed in “comments” column is being converted to 0. Is there any possibilities to work with characteristic as key figure. Or may be you can give a cue how(in which method) it can be solved? I have a solution ready for testing. Please send me an email. Is this fixed with Version 4.0. I am have an agg level on a DSO with comments in a column. When I load the data it says 1 records read and 0 generated. Although the file has 12 records in it with comments. Never Mind. The comments upload only seems to work only for Comment Characeteristics with Master data, if not it does not do anything. I am testing the function in BW on Hana 7.5 SP6. Sorry, Manuela. I don’t know why this is happening. Please open an incident so SAP Support can take a look. I am using BPC 11 system BW4HANA version. I have implemented the note you have suggested (Version 3). Unfortunately it was not working. Will you please help us the latest note no for flat file upload via planning ? Version 4 or something for BW4 HANA? the solution also works for SAP BPC 11, version for SAP BW/4HANA. Please use version 4 of the solution which you can find attached to SAP Note 2053696. Thanks Marc. It is working. the import for small files works well, but now I have a problem with a lagre file with 200 columns. Is there a limitation in the planning function? The field “File Format” only displays 250 chararcters. The display of the format will just be concatenated on the parameter screen (which you show). The file format can be as wide as you like. If you send me an email, I can provide a program to upload the file format from a txt file. Hi Marc, we use your solution with great success in our excisting planning solution on BW 7.3. Now we wanna create a new planning tool on BW/4HANA with BPC 11.0. Will there be a future solution for your upload Tool? Or is it an standard function for BPC 11 in the future? now that our customers start using your valuable upload function within the embedded BW of our simple finance implementation, we came across a strange issue: F4 help does not work properly in some cases, the “Search” button seems to be with no function. Are you able to have look into our issue 580950 / 2017? I think you will need to look into our system to believe it. 😉 As expected SAP does not give standard support on this. The solution is in the customer namespace but still build using standard SAP components. In your case, it’s ABAP WebDynpro with an SAP Search Help and this should work of course just like in other standard SAP applications. I will take a look at the issue and get back to you via your customer message. We are currently using your enhanced version of File Upload in our project. Unfotrunatelly we noticed one problem. The order of columns that are displayed in the File Preview is correct and consistent with the fields order definition in the FILEFORMAT parameter of the planning function. 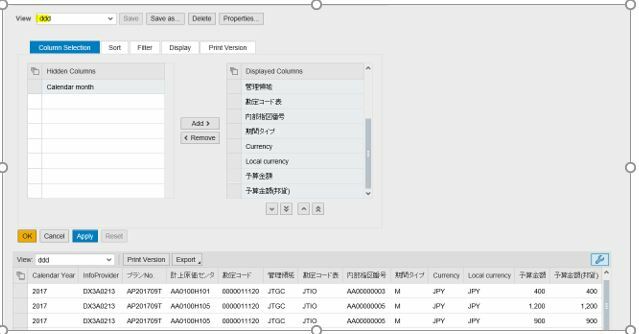 We would expect that also the Data Preview will show the columns with the correct order. But here the order is different and seems random. Is it possible to correct/change the order somehow? I tried to create a new view with the changed layout of the Data Preview. The problem is that this view is then available only for the specific user. Is it possible to create a view that will be available and initial for all users? Is it possible to transport this setting to other systems? 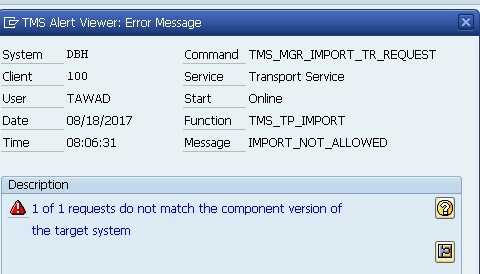 I raised an Incident for this issue but SAP Administrator asked me to contact directly with you. good observation and questions. No one has complained about the field order yet… I get the point and understand that it’s not optimal. The order is given by the internal data structures used by BW-IP. I have not had much time to play with it but there is one limitation: The fields are defined dynamically based on the aggregation level. If you are using the upload for several different levels, then I believe you won’t be able to have different initial views. :-(. So… I enhanced the solution to allow you to maintain the initial order of columns separately per planning function. If you are able to update to a new version, send me an email and I will provide it to you for testing :-). I’m trying to use the BADI’s method transform_file to transform a keyfigure-based file to an account based format. To my surprise, the method transform_file is called in step 6 of the planning function logic while method _convert_string_to_tab is called in step 3, so I can’t transform the data in the file to match the planning function. Do I misunderstand the use of this BADI? transform_file is the correct place do change the format. For example, the file contains KF1, KF2, KF3. You also need to include ACCOUNT and AMOUNT (as empty fields) if it’s not included yet. Then you can transform the records in c_t_file and move the data from each KF to a new record with the corresponding ACCOUNT and AMOUNT. The file upload will then ignore the KFx fields and take the data from ACCOUNT and AMOUNT (which obviously need to be in your aggregation level). I have a feature request: I would like to run the execution with packaging (described here: https://help.sap.com/saphelp_nw70/helpdata/en/45/946677f8fb0cf2e10000000a114a6b/frameset.htm – in the execution of a planning sequence in process chains you can select it ). Currently it seems that it runs without packages but I have the need to write the planning buffer in-between. Is it possible to integrate this as a flag maybe in the URL as a parameter? The complete upload function works on the premise of a single file that is processed in one package. So, unfortunately, this is not feasible to allow for automated packaging. However, you should be able to create your own set of filters and either add them as separate steps to the sequence or use several sequences within a process chain. thanks for this great development. Unfortunately we were struggling with our secured namespace because of the ‘/’. If we use the comment function we need use characteristics as a key in the direct-update DSO. The generated InfoObject name will contain ‘&’ and this InfoObject name is a problem when calling function module RSD_IOBJ_INCL_ATR_NAV_GET. This problem could be handled by replacing this ‘&’ and the generation namespace prefix by the original namespace. Do you think you can add this in the next version? It’s best to check this case in your system. Please create an incident report and ask support to forward it to my name. incident 204833 / 2018 is created. Not sure if it is already forwarded to you. the solution is now available via SAP Note 2053696 as well. is it possible to create / delete columns in the download file planning function type? the file format can contain InfoObjects that are not included in the aggregation level. You can fill them using a BAdI. If you do not want an InfoObject in the output, just don’t include it in the file format. 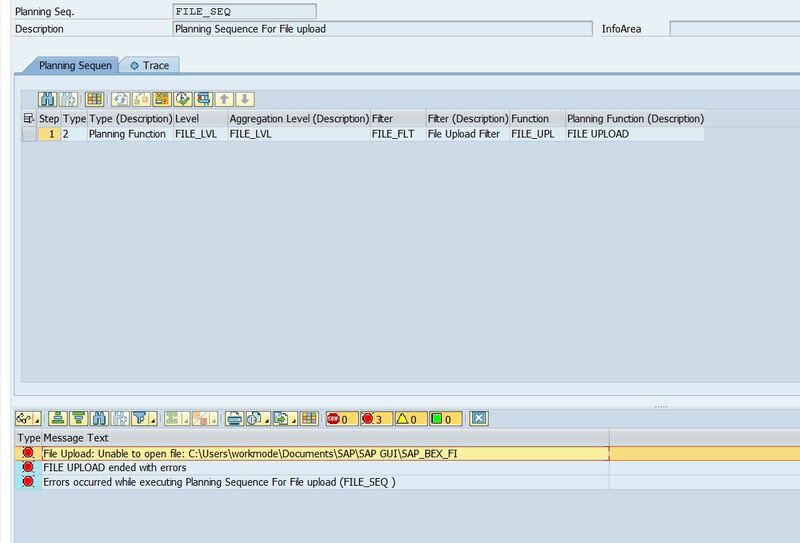 when you execute the file upload in transaction RSPLAN, then as a default, a fixed file name and path are used (defined by SAPworkdir environment variable). Change the file name in the parameters of your upload planning function to “Prompt”. Then the system will ask you for the file name in RSPLAN. Note: This is usually only for testing. Your planning users will use the WebDynpro and select the file that way. i tried uploading this sample excel data. i already activated the service but when i tried to access the link but its unreachable. should be seing the interface of the upload program? is there a step i missed or is this something that basis team can help me? i successfully accessed the UI the problem is more of the security issue. you have to maintain the master data for the characteristics Version and Customer first. We extensively and successfully implemented your application for our client, this is really powerful thanks ! We are only struggling with one open point: in the data selection header we need to restrict the F4 value help to the list of authorized value. We can do it using the F4 restriction BADI ; we have created a variable, put it in the filter, and also created associated BADI implementation ; this is working fine if we use the variable in a BEX query for instance. However, if we open the Webdynpro application, the variable is present in the data selection, but in any case the value help is restricting the values as defined in the BADI. The BADI is not even triggered actually, when putting an external break-point this is not going inside. Any insight ? Do you think we can open OSS message for that ? I am not 100% how to what extend your solution is supported by SAP officially i mean. I suggest to put a break-point into this RSD function. It should call the F4-Badi from there. Thanks Marc for your quick and clear response ! indeed ZRSPLF_F4_ENHANCEMENT needed to be adjusted, i did it. indeed when putting a break point this is triggering RSD_CHA_HELP_VALUES_EXIT. >> However in debug this is still not going into my implementation of enhancement spot RSR_VARIABLE_F4_RESTRICT where my custom code to restrict the list is actually defined in an implementation class calling method IF_RSR_VARIABLE_F4_RESTRICT~GET_RESTRICTION_FLAT. Am i missing something obvious in here ? Check that the enhancement spot implementation has the correct filter i.e. proper name of the InfoObject that is used behind the variable. Thanks, actually i am concerned because yes the enhancement implementation is properly configured, and actually this works smoothly when i try to execute the planning sequence in RSPLAN. But when opening the WebDynpro then there is no restriction anymore and if i put an external break-point inside the enhancement spot it does not go inside. Do you think we can open OSS message to get support on this ? (except if you have other ideas to suggest). I tested it again and the F4-BAdI is certainly called by the WebDynpro as well. Please create an incident with open GUI and HTTP connection (have it forwarded to me). Hi ! Thanks a lot. Meanwhile i have asked for system opening. It may take a few days, there is no emergency on this topic for the time being. I am trying to upload a CSV , after some transformation which results in a huge data set ( C_th_Data has finally more than 30 million records ). The upload takes a lot of time in the process EXECUTE_SERVICE (CL_RSPLFR_CONTROLLER) and fails due to internal memory issue. Can we skip the above process and as I do not need any validation. Please note the transforamtion works fine for a small set of data. There’s no way to improve performance or reduce memory consumption of the upload for such high data volume. Sorry, but planning functions – not just the file upload – are not designed for this. Thanks Marc for the quick response. If I reduce the volume to 5 million would it still be considered as a mass upload ? The file upload will have C_TH_DATA and at least one copy (sometimes several copies) in memory. Several million records probably still lead to memory issues. You will need some trial and error to find the maximum for your system (also with other concurrent users). But please, no complains about performance. If you want a fast load (that also requires less memory), use ETL. is it possible to integrate a button for a logout? Only closing the web browser is in some cases not enough to cancel a lock. interesting request. No one ever asked for it… but it was easy to implemented. Please send me an email, so I can send you a version for testing. could you please tell how what is the expected behavior for the field conversion marked with ‘X’ for the field value that has already been provided the user in the system format? Asking this as it currently generates an error without description – “File Upload: Table conversion error.”. If it is how it is supposed to work, would you be so kind and propose some workaround so both formats are supported? Would very much appreciate your reply. the file upload is using the same logic as the standard GUI_UPLOAD to parse a line of the file and separate it into fields. With field conversion turned on, this logic will validate data types, which includes the user’s date format settings. So the user must supply dates in the format they see everywhere else in SAP. If field conversion is off, there’s no such check. Since this is not coding of the file upload, I won’t be able to change or adjust it. The only way around it, is to upload in XML (which is unlikely to be accepted). The remaining alternative is to keep field conversion off meaning all values must be in internal format. However, what you can do is program your own conversion logic in the provided BADI and method transform file from user entries to internal values. You will have to do it for all fields and obviously cover the cases that any user might come up with (or you define). A bit of programming but doable. Appreciate your prompt reply as UAT’s are live. could you clarify the situation about “New Standard File Upload functionality” (I mean planning function type 0RSPL_FILE_UPLOAD_AO): is it possible to upload an .xls (not .csv) file using this standard function? Or the only way to achieve this is to use your Z-development? We are on BWonHANA 7.50 SP12, AO2.7. It does not support XLS, just CSV format. It’s a great tool for users who require mass download and upload data. The second issue is I can download the file through RSPLAN, but when I try to download it through webdynpro, I can the following error message as soon as I click Download button. do you know what could be the problem? How do I troubleshoot this? I tested it and the download of date works correctly and as designed. I tried all formats and it looks to me like you picked “Text (fixed)” format (plus “Convert field = X). This will lead to the behaviour you see since as you know, the date field has only 8 characters. If you want to see the complete date, select “Text (Tab-delimited)” (or CSV). The fixed format makes sense only if you leave convert fields off. I was unable to reproduce the second issue. Please check that you have the latest version 4.2 of the solution installed. If you can’t figure it out, send me the complete dump from transaction ST22. according to note, v4.2 only works for BW7.5 and BPC 10.1. Our system is still on BW7.4 and BPC 10.0. We have installed v4.0. For the first issue, I have fixed it manually for now by changing the _CREATE_DATA_STRUCTURE method line 17. When infoobject is of type D, instead of assign it D(8) type to the field in the structure, I have assigned it C(10) so that it will capture the full string of converted date ‘25.07.2018’. This has solved the issue for now. For the second issue, I’m still trying to troubleshoot where the problem is. It seems to throw an error even before it hits the planning function program. That’s a misunderstanding. Any v3 or v4 works starting from SAP NetWeaver 7.3. If you have SAP NetWeaver 7.4 or higher, then you need any v4 version… Of course, the latest is always the best. So v4.2 should work for your system. ok. I will deploy it and try again. Just one suggestion, can you change your document to clarify this misunderstanding? Done. The 4.2 document contains a compatibility matrix. Does this tool allow us to download/upload the text instead of key of field? It is not very user-friendly for business users as most of the time it is hard to interpret what key represents. that’s a good point. You can enhance the solution to include the texts: In the download file format, add some fields for the texts (like 0TXTLG). Then use the TRANSFER_FILE enhancement spot to fill the text fields (chapter 5.7 in the guide). Thank you for you suggestions. I’m just back from holiday and testing this. For this to work, I need to define both key and text of the field as output fields in the ‘File format’ of the planning function. What if I only want to output text field in the file? Is it achievable using BADI as well? Similarly, I only want to have text as a input in the upload file. When we’re trying to upload and save data to a direct update DSO short dump occurs. In the error there is a reference to a characteristic which we’re using as a key figure -“/BIC/ZBP_DESC (comments a stored there). We’re on BW 7.4 SP16. The planning model is very simple: Write Optimized DSO -> Aggregation Level. Error occur when we press on the save button. Thanks for any further assistance. planning is only supported for InfoCubes and Direct Update DSO. If you are using a Direct Update DSO, please create an incident. Problem was caused by derivation that we’re using to record changes in planning data (logging – user, time, document id). We turn of this functionality and switched to BADI RSPLS_LOGGING_ON_SAVE. I am using Version 4.0 . Is there a possibility to hide the warning messages with the parameter Show_messages? yes, that should work but you might miss some messages that are important for the user. Try show_messages=EXA. I tried out your suggestion, but still the warnings are displayed. Do you have another idea? thank you for the solution. I will update the Version and test it again. thank you for updating the tool so steadily! We also want to use the upload with “column = time period” and therefore to suppress the warnings is useful. Even though we have to keep in mind that locks are displayed as warnings will not be shown when surpressed. Always a pleasure to make it more useful. Changing a few lines of code here or there is no problem. The lock messages are coming from the IP framework and not the planning function itself. Therefore, the lock warning is still visible even if you use show_messages=EXA. Could you please tell if it is possible to round floating point key figure upload with nine decimal places (max) to the way BEx does it? Even though the same Key Figure is used for the flat file upload, the values uploaded via the flat file differ from the ones in the file and in the Input-Ready Query. Result: Values do not match and do not sum up. floats can be tricky. Unfortunately, we can’t guarantee precise numbers which is due to the nature of how floats are stored (i.e converted to binaries). And this becomes more difficult in cases you have to add several floats together as is often the case in planning.